Lake Don Pedro Marina is near the southern end of Lake Don Pedro Reservoir. 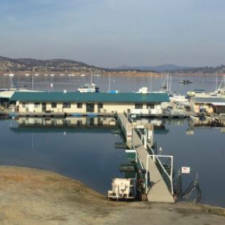 Lake Don Pedro Marina is a full-service marina providing almost everything that you need to complete your vacation experience at Lake Don Pedro. Here you will find everything from houseboat rentals to grocery items, fuel, souvenirs, and tasty treats! This marina has a boat repair shop, a dry storage facility, a convenience store, and a café for visitors stopping through. There are houseboats, ski boats, fishing boats, and boat slip rentals available. Visitors can also choose a deck cruiser or a spacious patio pontoon boat to take around the lake. Personal watercraft are also for rent. The Lake Don Pedro Marina owns the Fleming Meadows Campground, which is on the west shore of the lake.